A content strategy can be used to look at the overall publishing messages and processes for an organisation. Or it can be focussed to one particular channel or element of delivery. In this post we look at the brilliant Anthony Nolan’s Facebook content strategy and see how they went from mainly ‘housekeeping’ type posts / sharing news stories, to using first-person, authentic storytelling with dramatic results. Anthony Nolan is a national charity who match people “willing to donate their blood stem cells or bone marrow to people with blood cancer and blood disorders who desperately need lifesaving transplants”. The small digital team had built up a healthy following on their social media channels. Inspired by the NHS Blood Donation’s approach to storytelling and some successful trials, they wanted to refocus their Facebook comms. 45 Facebook posts to 50,000 followers. 30 posts were niche or transactional ie ones requested internally to promote an event or news item or fundraising activity. 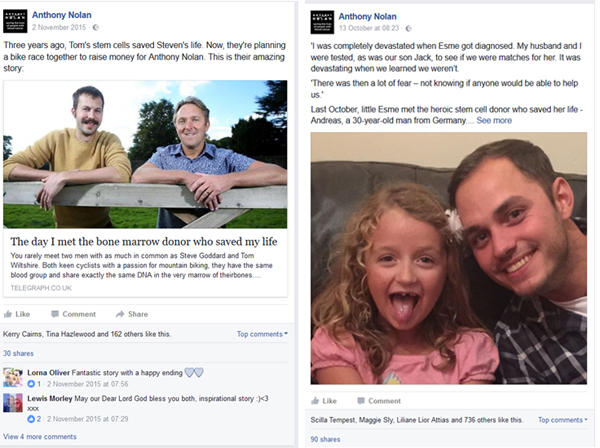 15 posts were story-led about stem cell donation, transplants or blood cancer. These performed better. Average of 279 engagements per post. The team recognised how powerful stories could be but there was no overall direction or resources to find stories. They also identified that there was internal pressure to promote department-specific needs. 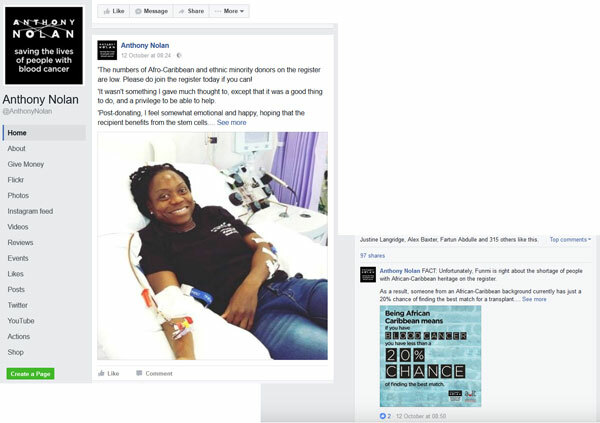 The team had been watching how NHS Blood Donation used Facebook to celebrate and inspire donors. In January their own patient appeal (#Match4Lara) flourished on social media leading to copycat appeals from other families. Previous campaigns had been press-media focussed. Their approach needed to change to be able to respond to and support donor searches using social media. A myth busing campaign (#DonatingIsntScary) in October 2015 used first-hand donation stories on social media. This worked well and encouraged the team to trial new processes to encourage donors to share, which they did. This helped to prove that storytelling should be the main focus on Facebook. The team analysed their stories and did lots of thinking about the roles and goals of stories. This included looking at Joseph Campbell’s The Hero and Age UK’s use of positive storytelling. They developed their own profile for stories which would support the goals of the organisation. The hunt (urgent) – (someone needs to find a donor). The story raises awareness and educates a cold audience about matching. This is a real, human story that inspires people to help. The hero (informative) – (someone amazing is donating their stem cells). The story demonstrates how donation works and reassures potential donors about the process. It creates positivity and shows donors are heroes. 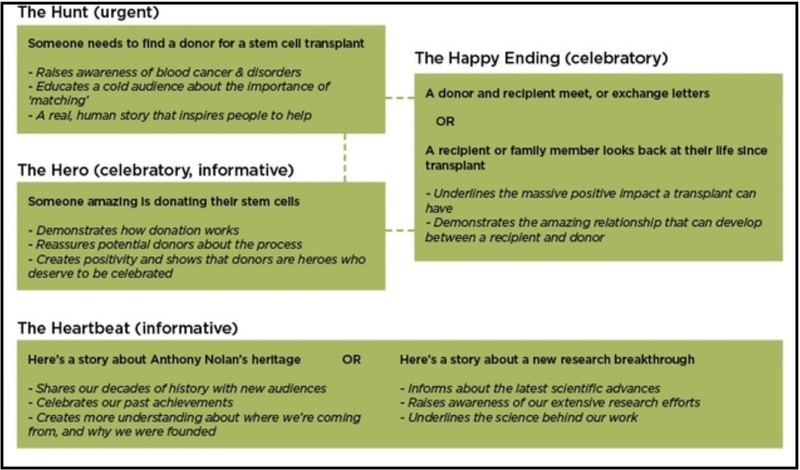 The happy ending (celebratory) – (a donor and recipient meet or exchange letters or a recipient or family member reflects on their life since the transplant). The story underlines the positive impact a transplant can have and demonstrates the amazing relationship that can develop between a recipient and donor. The heartbeat (informative) – (stories about AN’s heritage or about new research breakthrough). pillars should be the majority in comparison with niche posts, at least 1:1. Stories are repurposed or re-shared from posts shared by the community. working with colleagues to create posts which combined niche calls to action with storytelling. These were used to inspire and encourage other colleagues when these did well. communication and compromise. They spent time working with colleagues to think about which channels could be used as an alternative when their posts wouldn’t work on Facebook. In the second week of September 2016 there were 5 posts, each used one of the pillars (all four were covered). Each post got more than 3000 engagements. The posts reached over 1 million people organically. There were 16.2k engagements. The team were excited to benchmark this against NHS Blood Donation who got 16.3k in the same week. The average number of engagements in August was 1267. This was a 450% increase on August 2015. Take a look at Anthony Nolan’s Facebook. It is brilliant because it is all about people rather than ‘the charity’. The organisation is the facilitator, unifying the message but it is the people who are doing inspiring things or the ones needing help from others. The pictures are not stock images, but of people doing something, a picture capturing a moment. The stories are from the people rather than about them. And AN do a great job of responding to questions and explaining things. They are part of the community, not owners of it. The five people working on social media are seen to provide customer service (there are also three in the digital team). Robert Duff really is an extraordinary human being. Posts are concise but engaging. They are written in a warm, urgent, persuasive way. People want to comment / like / share. Anthony Nolan have inspired their community to be one which doesn’t simply passively read but are connected and active. These stories do everything to link people who are going through similar experiences. They help people who are going through horrible times to feel that they are not alone. They also inspire people to become donor heroes. The community thanks donors and the donors feel loved. Which makes more people want to donate. By being brave and strategically refocussing their Facebook content they have created a community which is supportive and content generating. Their work on Facebook is helping to deliver the goals of the organisation. It can be a brave thing to make a significant change like this. Clearly for Anthony Nolan, the instinctive change to focus on storytelling has proved to be one which has significantly increased engagement and awareness. I don’t think this approach would work for everyone. It works for Anthony Nolan because they were able to distill their key messages down to four types of stories. It also works because their audience of donors and patients (plus their family, friends and supporters) wants to share and read and react to these stories because they reflect their own experiences. As as story the search for a match works, as there is an urgency and potentially a solution which anyone could contribute to. Finally the community is lively and active and AN have nurtured it with their own engagement by thanking, sharing and recognising contributions. Most organisations don’t have the capacity to find stories to share in this way. And there will be many causes where there are sensitivities which mean that stories have to be anonymised or people don’t want to or can’t tell their own stories via Facebook. Setting a target for user-generated stories for these causes or for organisations without a super-engaged community is unrealistic. Saying that, many organisations just use Facebook for housekeeping / noticeboard comms (eg fundraising / news / #mondaymotivation etc). It is hard to reach people when posts don’t get the organic traffic generated by the likes / shares / comments etc. So in order to use Facebook to its potential, posts should always be engaging. Stories are one way to do this. Many charities could do with a think about how to use the channel to be inspiring and supportive, seeing it as a service rather than broadcast. Is your organisation ready to make a drastic change to the way it writes, produces or shares content? Does one of your channels need a re-think? Doing content strategy work is an opportunity to ask questions about whether your approach does need a refresh. Messages get stale, audience needs evolve and the popularity and usefulness of channels ebbs and flows. Charity comms also go through trends. Storytelling and video are big now, but live streaming or Virtual Reality might become the next big thing. Any process looking at content strategy (whether org-wide or channel specific) would start by looking at the organisational strategy and analysing how content should support this – messages first with channels and delivery methods after. Ideas for change would be tested by looking at the processes, impact and audience for the content. To get the most out of your content, it is a process worth doing. Have you made a similar change? Have you done a large or small-scale content strategy? What impact did it have? What do you think of Anthony Nolan’s use of Facebook? Why does it work? What can you learn from it? With big thanks to Jon Ware who shared Anthony Nolan’s journey with me. I will be presenting this case study as part of my workshop on Content Strategy at the Charity Writing Communications conference on 25 October 2016. Read more about Content Strategy and various posts about storytelling. Oh and find out about the 8 ways you could save a life. This entry was posted in Content strategy, Storytelling. Bookmark the permalink. Thanks for such a great story and analysis. I’m facilitating a members network – within RSA – and it set me wondering about a strategy to encourage people to tell their own stories. However, it can be difficult enough to elicit introductions. Maybe we need some common themes to release contributions. Hi David, themes is a good idea. The biggest barrier is the challenge of developing a culture of sharing. No one wants to be the first to say something in case it is wrong. So anything you can do to fill the space or make it easier to contribute will help get things going. Are there some members of the group you could prime to be the first? Or sharing a public story which people can comment on and share their own experiences / views? I think it works for Anthony Nolan because of the community is going through the same intense experience; people want to read about it and want to share their own ‘journey’. What is the hook that binds your members network? How can you channel this?